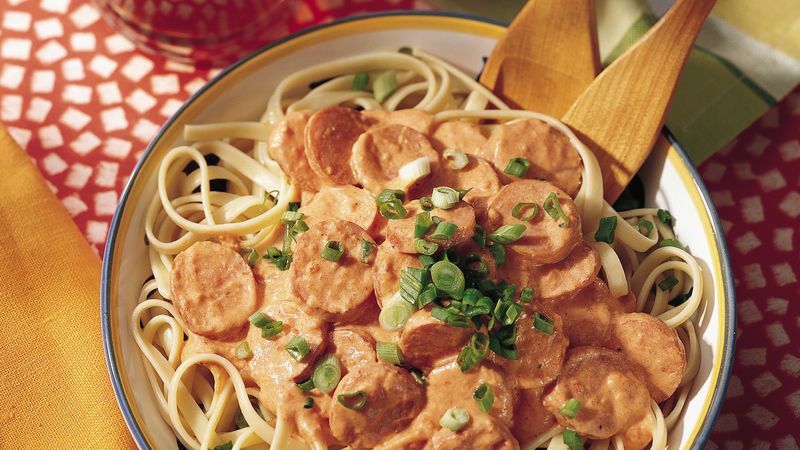 While fettuccine is cooking, place whipping cream, Creole seasoning and bell peppers in blender or food processor. Cover and blend on high speed until smooth. Serve sausage mixture over fettuccine. Sprinkle with onions. Cajun seasonings are boldly flavored spice blends. Although many types are available in the grocery store spice aisle, most contain some combination of garlic, onion, chilies, black pepper, mustard and celery. Using roasted red peppers from a jar saves lots of roasting time in the kitchen! Look for them near the spaghetti sauces and Italian ingredients or near the canned vegetables in your grocery store.